The schooner tour companies in Rio de Janeiro take travelers on a cruise around the 300 islands of the Angra dos Reis archipelago. These tours focus on the beauty of the islands with their white sand beaches and mountainous lands. Most schooner touring companies take visitors on a 5 hour sail around the Angra dos Reis Islands. The schooner will stop at one of the islands and allow the passengers to get off and take a swim in the ocean. Back on the boat a lunch buffet is available and no extra charge. 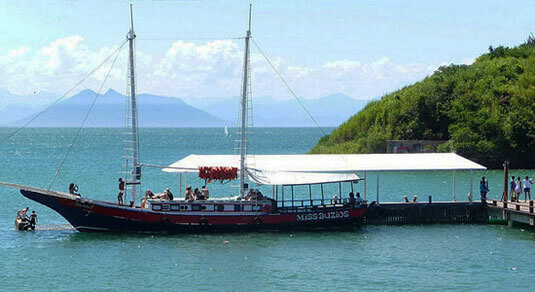 Another popular schooner tour is a cruise out of Sepetiba Bay in Itacuruça. These cruises feature a full bar with an array of local tropical fruit. This cruise stops for a swim and then returns to Itacuruca. The trip takes about 10 hours. One of the favorite aspects of the schooner tour is the view. The schooner sails under the Rio Niteroi Bridge and into Guanabara Bay. Along the way, travelers can see some of the spectacular coastline. Sugar Loaf, downtown Rio de Janeiro, Botafogo inlet and the St. John and Lage Forts as well as the Saint Cross Fort and Fiscal Island are all amazing landmarks. One of the wondrous sites you will see on the schooner tour is some incredible wildlife. The sea is a backdrop for dolphins that frolic in the wake of the schooner. There are also impressive sea turtles as well as graceful sting rays moving through the warm ocean waters. Flying overhead from island to island are the beautiful giant king-fisher and brightly colored macaws and parrots.Schooner tours are easy to arrange in Rio de Janeiro. Their focus is to show the beauty of Brazil from the water as well as the lovely islands surrounding the city.